Into The Woods Movie Review - Are You Screening? You’re hitting niche hard when you adapt a musical, though it’s interesting how far that needle has shifted from 50 years ago, but when it’s a family-oriented, musical, fairy tale mashup, the idea is either genius, or completely insane. 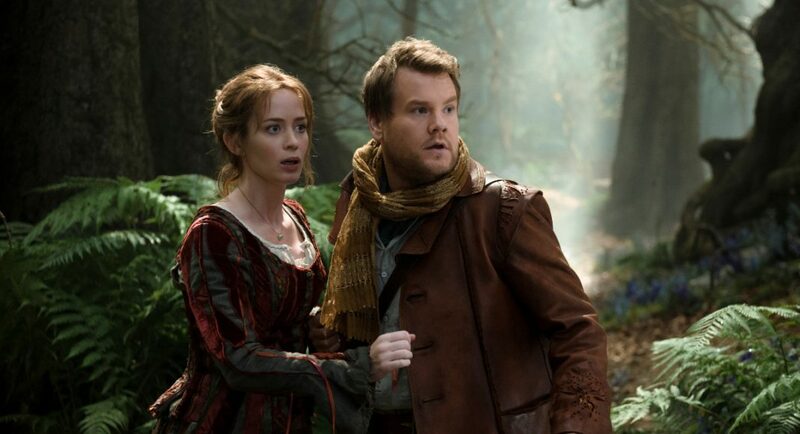 Into the Woods is a slightly crazy effort that mixes many of the most famous fairy tales you’ve ever heard into one story that connects everyone involved to everyone else, mostly centered around The Baker (James Corden), his wife (Emily Blunt), and the witch (Meryl Streep) who has cursed his family. It’s a movie with magic spinning in and out of it so furiously, almost viciously, it wouldn’t be hard to convince you that Tim Burton had a hand in things. In fact, Rob Marshall (Nine, Pirates of the Caribbean: On Stranger Tides) is a harder sell. This ends up being an effort, because it’s wildly brilliant to look at, that might owe more than it should to cinematographer Dion Beebe. 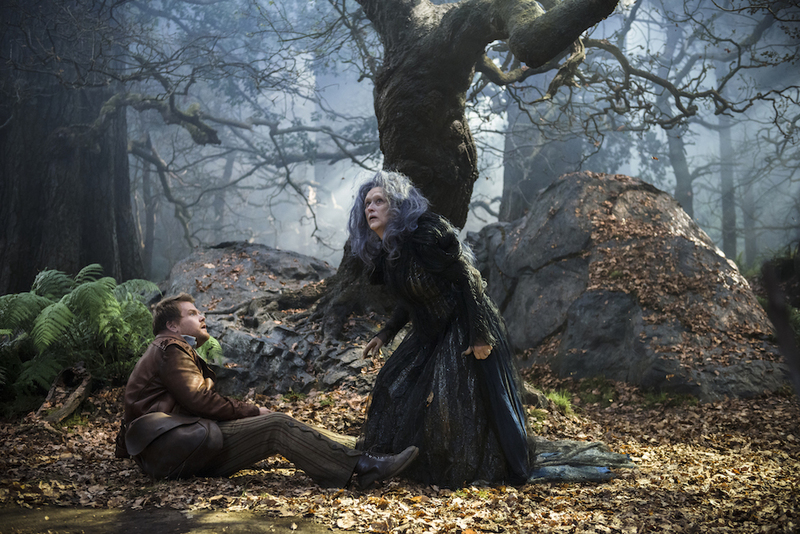 The idea stands out, mostly because there’s a fun that spills out of Into the Woods that doesn’t feel like it comes from Marshall, and can’t be attributed to the cast alone. As I said, the story revolves around the Baker and his wife, and the fact that they can’t have kids. It turns out that this is because the Baker’s house (apparently in the Game of Thrones sense) has been cursed, but the witch shows up to offer them a way out. If they can retrieve four items for her, she’ll lift the curse. These items lead us to Little Red Riding Hood, Rapunzel (who is already connected to the witch), Cinderella (Anna Kendrick), and Jack and his magic beans. The back and forth can be hard to keep track of, largely because the movie is a brisk effort, and remembering all the lines that tie everyone together isn’t something the movie really care about. It’s too busy whizzing about with its magic wand to worry about whether or not you can follow. The details are irrelevant, and oddly Shakespearean, because this is the sort of effort that, as long as the plot comes together at some point, we’re just aiming for the fun of the ride. So long as the moments work, provide a few laughs and some entertaining notes, the spectacle is the thing here, and what a surprising spectacle it is. There’s a piece in the original script of the musical that includes a note that reads, “The Woods must become a character, or the thing won’t work.” That’s one of those nonsense concepts writers throw out frequently, and critics occasionally nod to, that doesn’t mean anything anymore, because the fact that a handful of movies have managed a similar idea doesn’t mean it’s actually possible. It doesn’t work in Into the Woods either, but it comes damn close. There’s something about the background, feverish non-seriousness to the telling that renders any “real” effort to bring the woods to life impossible, but the curious mix of characters and actors almost manage it anyway. The most surprising note in all of this is that James Corden ought to be out of his element, and he has a lot to do, but he does far better than just holding his own. He’s in company that ought to eat him alive, and I’m actually a fan, but neither Meryl Streep, nor a fantastic Emily Blunt overshadow him. It could be that he has a fair amount of experience playing decidedly similar characters, going back to Gavin & Stacey, but it hardly matters. In the end, as you might expect from most everything with Disney attached, the film is review proof. That’s probably all the more true when we’re just adjusting something that already exists for the screen. The songs, the story, and the overall feel are only tweaked so much, even to the extent that the sets often look as though they are built on a stage, and the only real question is how well these actors work the material. Even that only matters in a very particular sense, because the whole thing is just so much fun that you actually lose track of what you’re paying attention to, in order to criticize it. Assuming no one forced you into a film you have little hope of enjoying, this is going to be one of your favorites of the year.